Hamster Club :: Hamster Laundry or Lunch? Once again, Rocky had disappeared during one of his daily outings. This time, I hadn't seen him for more than an hour, though I had searched in all his favourite nooks and crannies. "Oh well," I thought, "he'll turn up." Meanwhile, I might as well get some work done. Sighing, I turned my attention to the basket of clothes to be ironed, heaped high next to the washing machine. A good two hours later, the laundry basket was almost empty. Ah! There was my favourite purple blouse! Carefully, I spread it out on the ironing board. To my dismay, it looked like a slice of Swiss cheese-full of holes! What could have happened? Then it dawned on me. Rocky must have been up to his tricks again. Quickly, I dumped the rest of the clothes onto the floor. With a scuffle and a squeak, the culprit appeared, peering out from under a pair of cotton slacks. He looked as contrite as ever a hamster could but there was to be no mercy this time! With thumb and forefinger, I took Rocky firmly by the scruff of the neck and returned him to his cage. Then I went back to take stock of the damage. The rascal had certainly put his sharp little incisors to work! Another blouse, three linen handkerchiefs, and two pairs of shorts were so riddled with holes that I dropped them right into the rag bag! 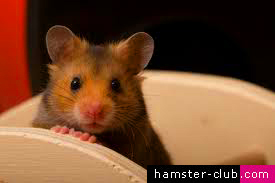 If you love the hamster stories about Rocky the Hamster, please click here to read more.